Most of the users agreed that the Puma Tsugi Jun offers superior comfort for the foot. Several of the buyers admired the attractive colorways of the sneaker. A good number of consumers claimed that the shoe provides good support for the foot. Some of the reviewers were highly-appreciative of the style and design of the Puma Tsugi Jun. A couple of users praised the easy on and off with the slip-on feature of the sneaker. A few of the buyers were satisfied with how the shoe is good to be worn in the gym. A handful of consumers said that they recommend the shoe. The Puma Tsugi Jun is available in multiple color combinations. One may grab a pair of the sneaker at an affordable price point. A few of the buyers noted that the Puma Tsugi Jun may fit a bit tight. A couple of reviewers pointed out that the insole may feel a bit stiff. The sneaker may run larger as what a few of the buyers said. A fresh update for the Puma Tsugi Shinsei, the Puma Tsugi Jun, exhibits the signature side-lacing system of the Tsugi series. It offers excellent comfort and delivers high-performance. Its stylish design displays a futuristic appearance that gives more appeal to the silhouette’s image. The mid-top profile and slip-on construction of this sneaker also gained praises from wearers as they appreciate the convenience these features offer. With its innovative updates, attractive colorways, street-fashion image, and attractive price, the Puma Tsugi Jun is worth a look. Puma is one of the leading and innovative footwear manufacturing brands. It has proven its worth in both sports and lifestyle category with silhouettes that offer high-quality performance and remarkable style. As another innovative approach, the brand fused German and Japanese technology and took inspiration from it for their new footwear products. Puma Sportstyle Creative Director, Heiko Desens, led the brand’s designers and introduced the Puma Tsugi Shinsei. This creation made way for the brand’s sneakers’ future. The Puma Tsugi Shinsei features the new designs that the brand has been working on since 2015. Puma aimed at producing sneakers that are built with advanced technology and materials, and that are also victorious casual footwear. The Puma Tsugi Jun is also a part of the brand’s Tsugi line. This mid-top silhouette represents the next generation of the Tsugi as it features the full evoKNIT sock upper along with its engineered ribs and heel elastic and the premium leather that id added on its side panels. In the modern world of lifestyle, the street-style is considered one of the leading categories of fashion. Top footwear brands incorporate into the constant evolution of the category and keep up with the trend through creating innovative products. Through the Puma Tsugi Jun silhouette, Puma showcases its street-friendly style. The new mid-top silhouette presents the combination of technology, Japanese and the modern style as well as the oriental tradition. The shoe is the emblem for the new era of street-style fashion. 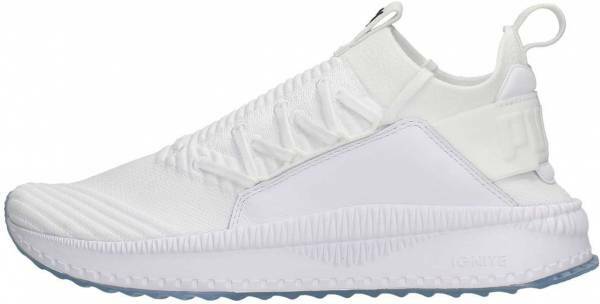 As what has been said, the Puma Tsugi Jun represents the street, and thus, it is a shoe that finishes off a street-inspired look effortlessly. Joggers, cuffed fitted jeans, jogger jeans, skinny jeans and even a pair of shorts fit well with the sneaker. The Puma Tsugi Jun is perfect for casual events, running errands, and even attending music festivals to finish off a stylish ensemble. The side lacing system of the Puma Tsugi Jun provides an adjustable fit for the wearer through pulling the laces for the desired fit. Its evoKNIT upper construction along with the leather bands and the elastic band on the heel wraps the foot in comfort and support with its adaptability. The mid-top sneaker is offered in medium width and available in size 7 US to size 14 US for the men’s sizing and size 5.5 to size 11 for women’s sizing. Half sizes are also offered for the shoe. Puma applied the full evoKNIT upper on the Puma Tsugi Jun which hugs the foot of the wearer in extreme comfort. The engineered ribs of the silhouette deliver enhanced flexibility, while the engineered elastic keeps the heel in a secured lockdown. The mid-top sneaker also features the premium leather on its side panels which offers midfoot support and additional stability. The design of the shoe is finished off with its signature side lacing system and side tooling that serves as the unique trademark of the Tsugi silhouettes. The Puma Tsugi Jun is worn by The Weeknd in the “Run The Streets” Campaign. He is also the Global Ambassador of the brand. Cara Delevingne wore a pair of the Puma Tsugi Jun for her Puma endorsement. The sneaker features a slip-on construction. A Puma heel pull tab which helps for an easy on and off can be observed. The shoe is built with an injection-molded ethylene-vinyl acetate midsole that offers a lightweight performance. Puma branding on the heel of the shoe. The signature Puma Cat Logo is displayed on the upper of the shoe.